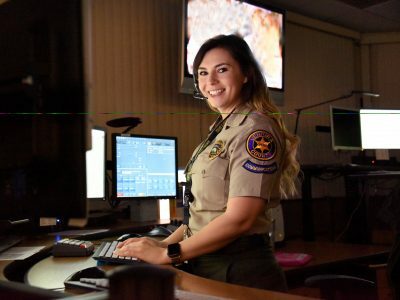 The Sheriff’s Communications Center (SCC) is an integral part of the Ventura County Sheriff’s Office. The SCC works closely with patrol services and the Sheriff’s Watch Commander to provide outstanding service to the people of Ventura County. This includes handling emergency and non-emergency law enforcement calls for service 24-hours a day for all of the unincorporated communities and five cities under Sheriff’s Department contract. The SCC team receives requests for assistance, evaluates what assistance is needed and dispatches appropriate public safety personnel via state- of-the-art computer aided dispatch (CAD), phone and radio systems for the unincorporated areas of Ventura County and the cities of Thousand Oaks, Camarillo, Moorpark, Fillmore and Ojai. The SCC team is committed to assisting in safeguarding the lives and property of residents of Ventura County and responding to public concerns in a manner which promotes neighborhoods free from the fear of crime. Our strategy for accomplishing this mission is to preserve the peace, prevent crime, assist in apprehending offenders, facilitate problem solving community partnerships, and communicate empathy and respect for the dignity of all individuals.